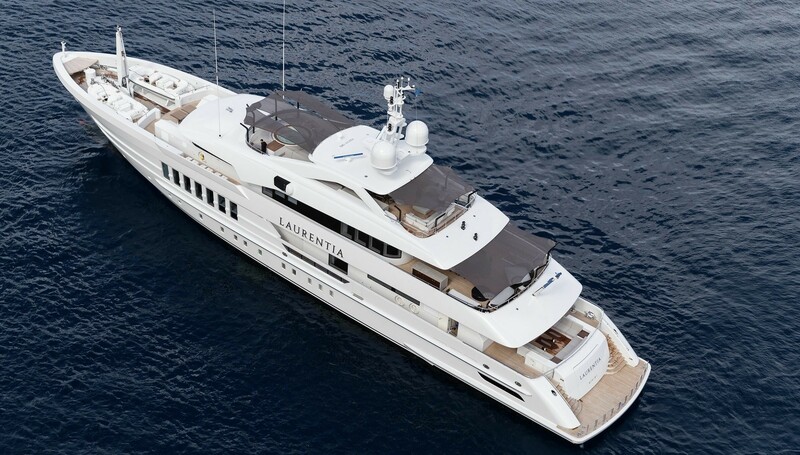 Superyacht LAURENTIA ( built as PROJECT ALIDA / YN 17755) is a 55m/180ft steel hull constructed and launched by Heesen in 2017. 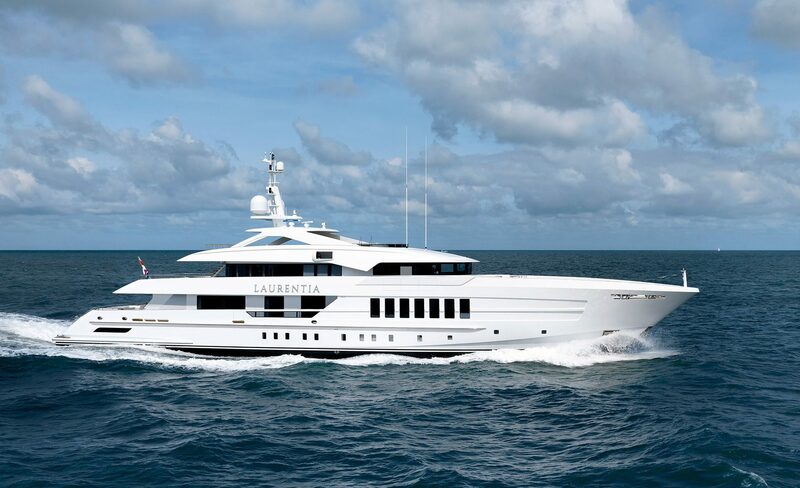 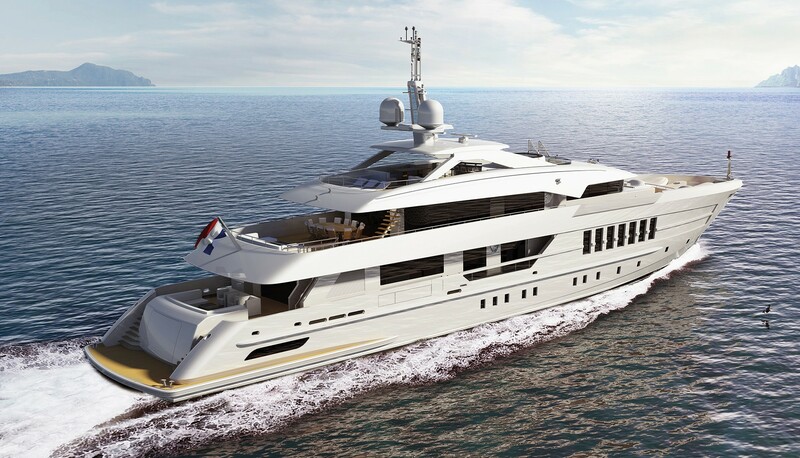 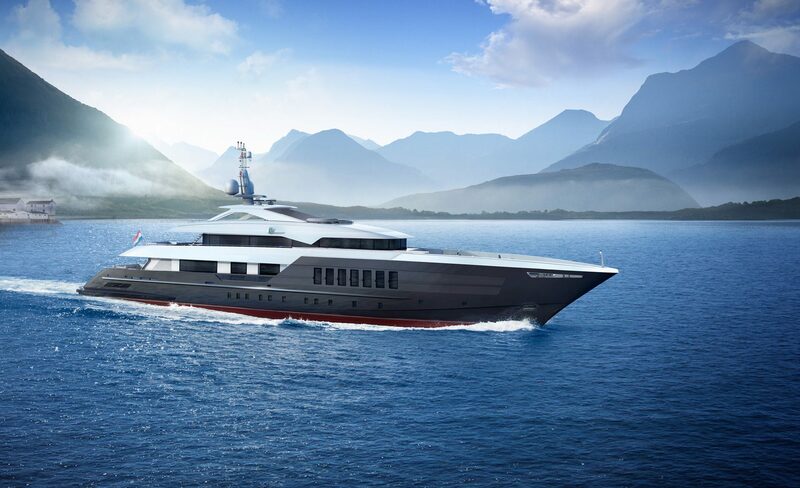 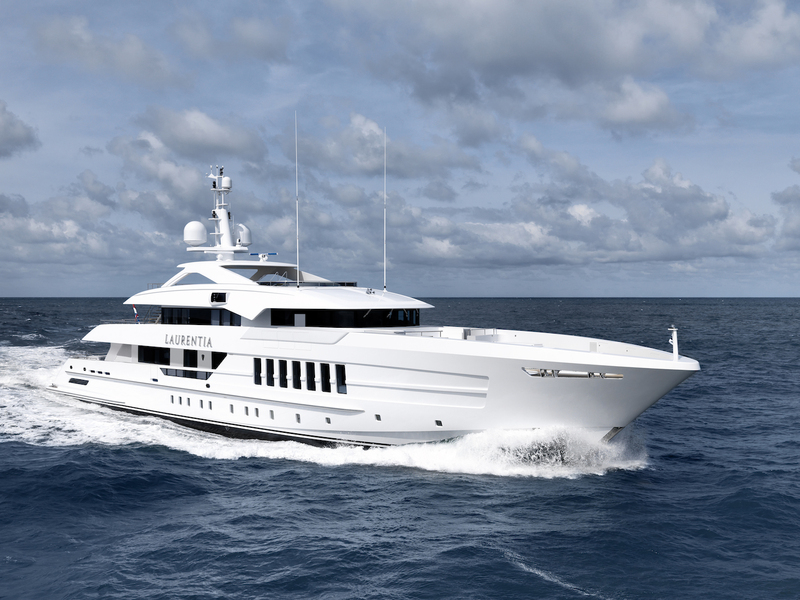 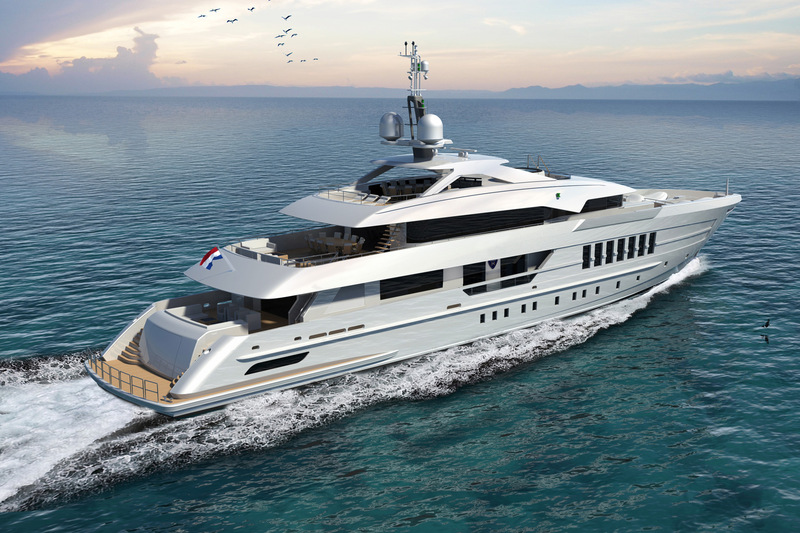 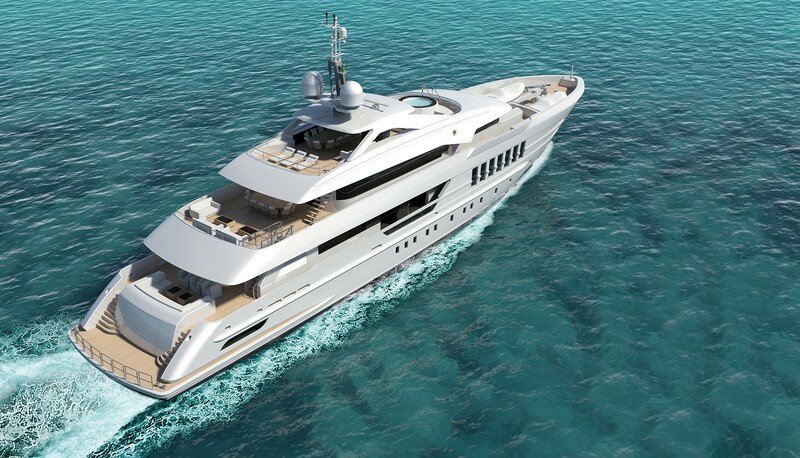 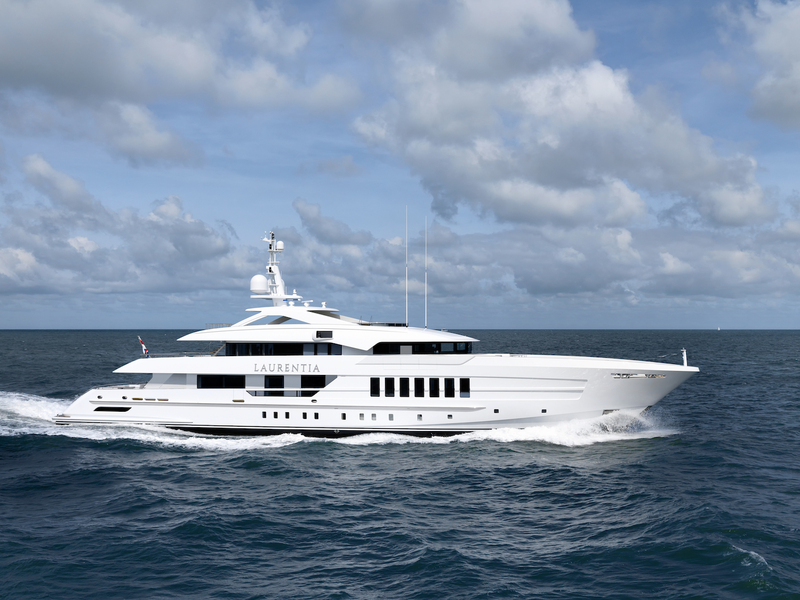 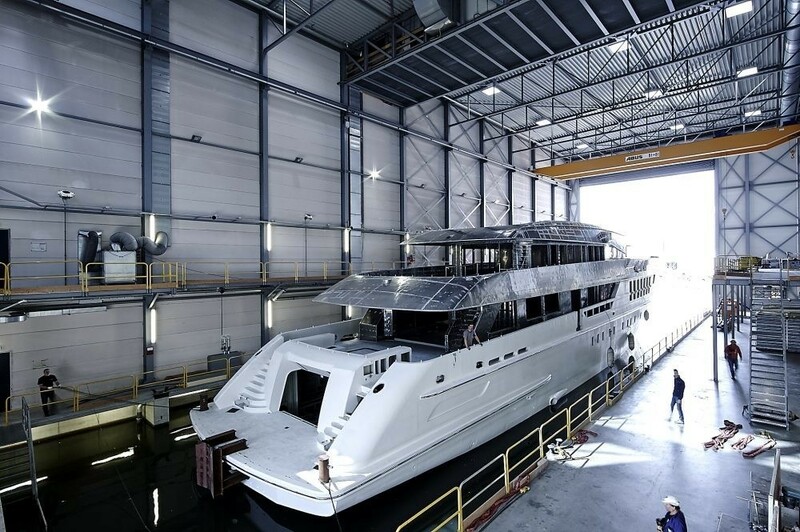 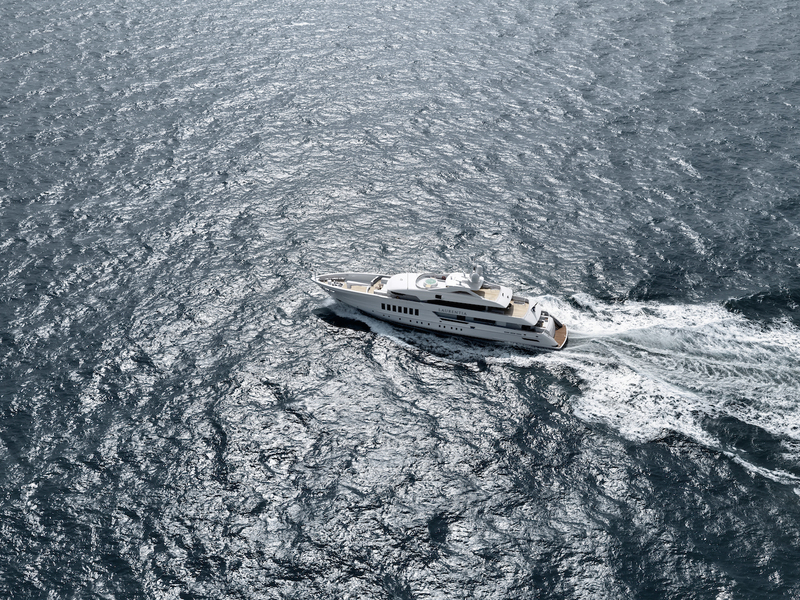 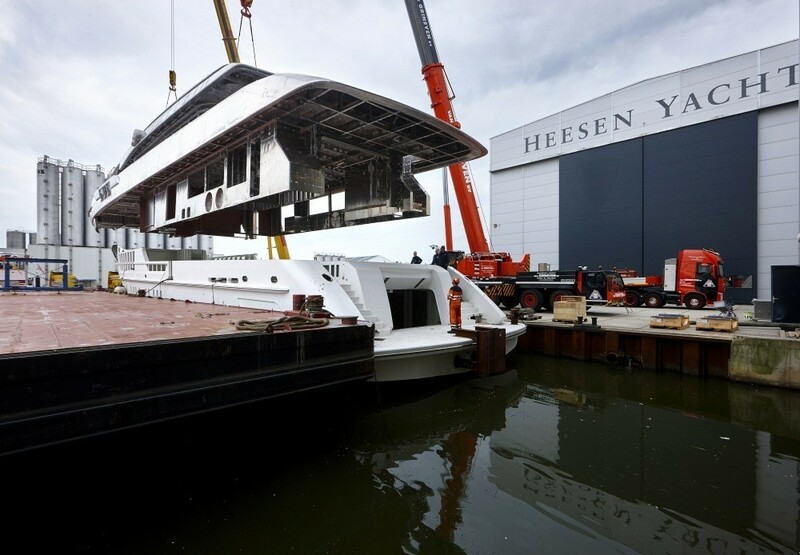 Naval architects Van Oossanen designed her Fast Displacement Hull Form (FDHF) for efficient fuel usage and excellent performance, while Frank Laupman of Omega Architects designed her strong exterior profile. 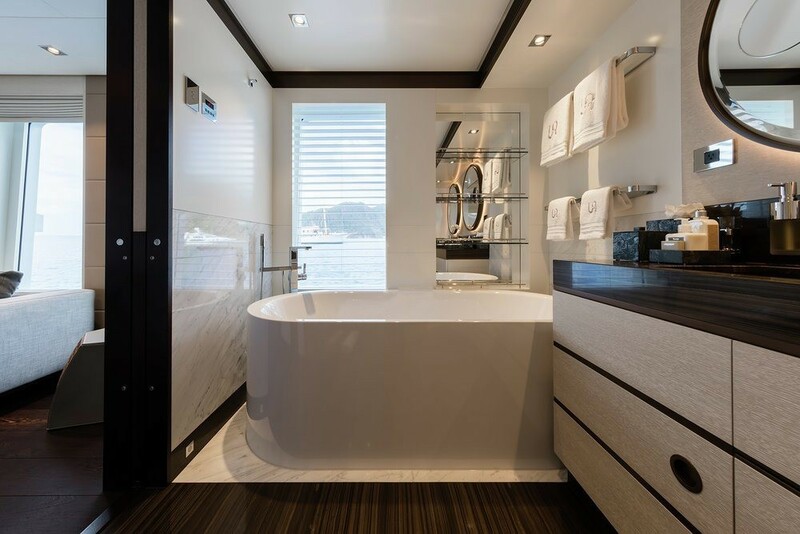 Her elegant interiors were designed by RADYCA design studio. 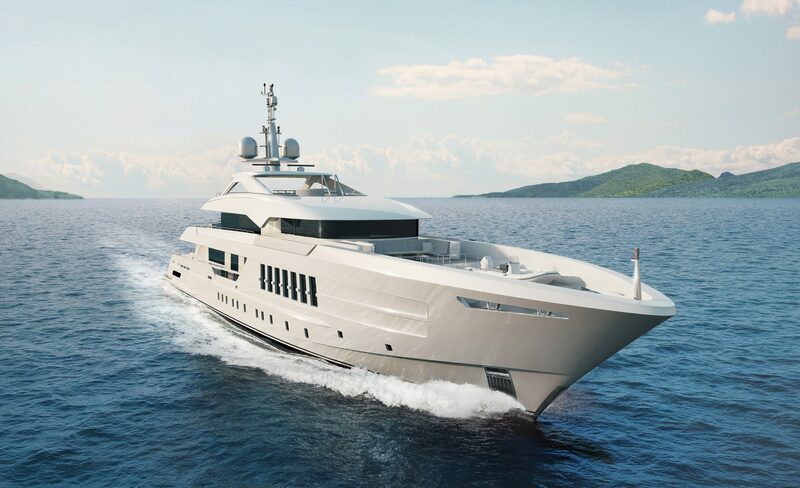 One of her unique identifying features is a sundeck overhang with a tooth-like appearance to compliment the shape of the bulwark below. 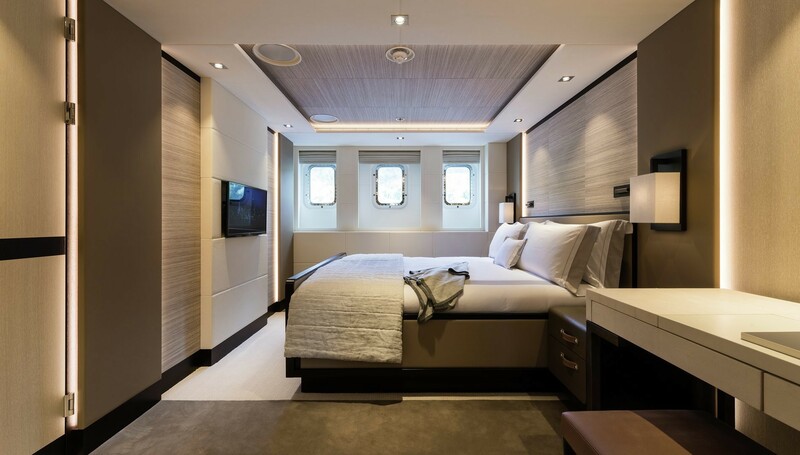 She is able to accommodate up to 12 guests in 6 cabins. 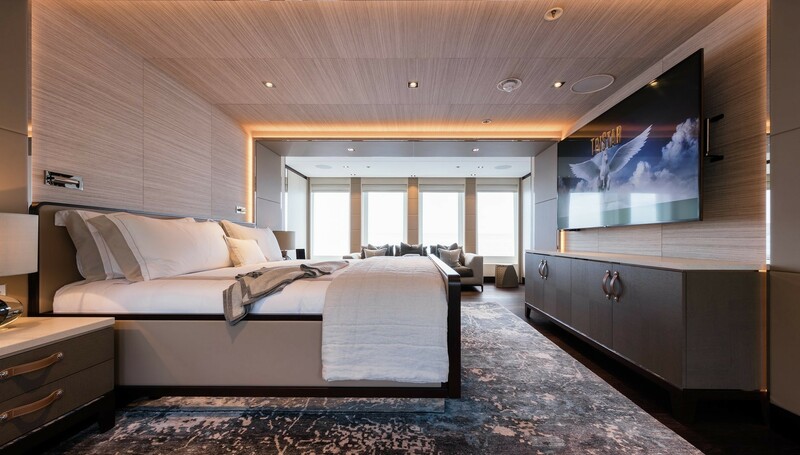 The 740GT interior was styled by Miami-based design studio RADYCA using neutral tones in white oak and wenge, white Arabescato and brown Grecale marble. 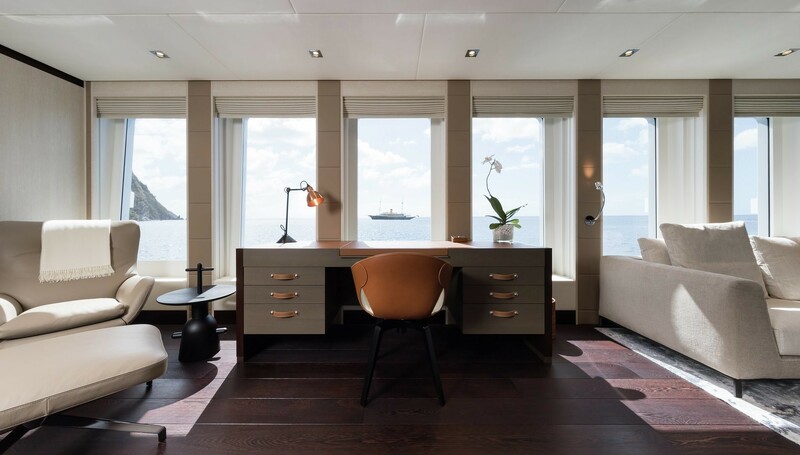 The furnishings come from British and American design houses and are made from leather and suede, and wool carpets complete the quality natural interiors. 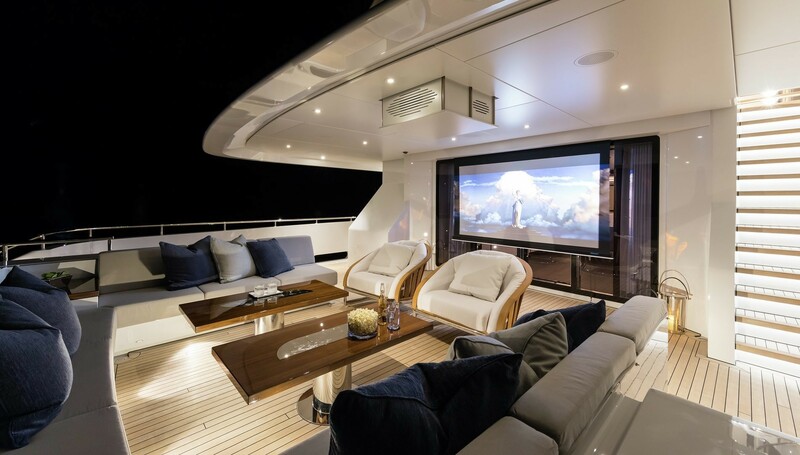 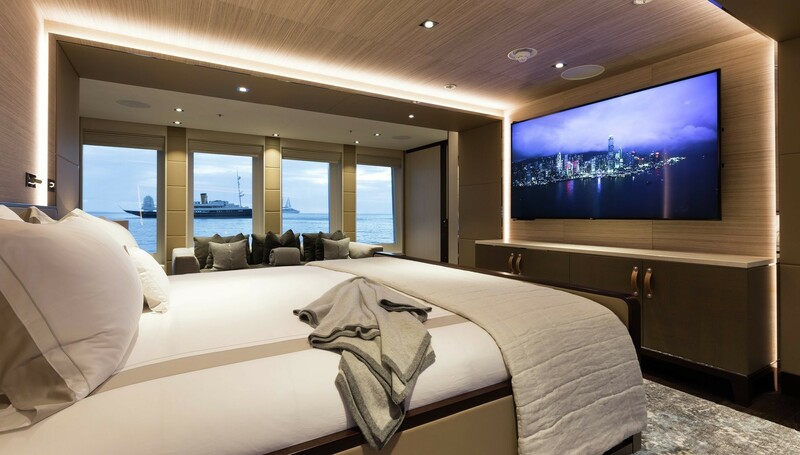 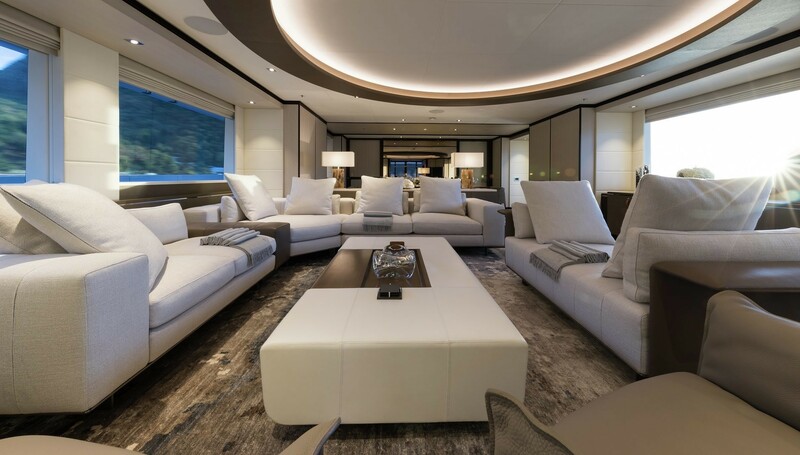 The main salon places a large L-shaped sofa, a second sofa and two armchairs beside the port windows to leave the starboard clear for foot traffic between the main deck aft and the forward Master suite, which comes with its own lounge and study space. 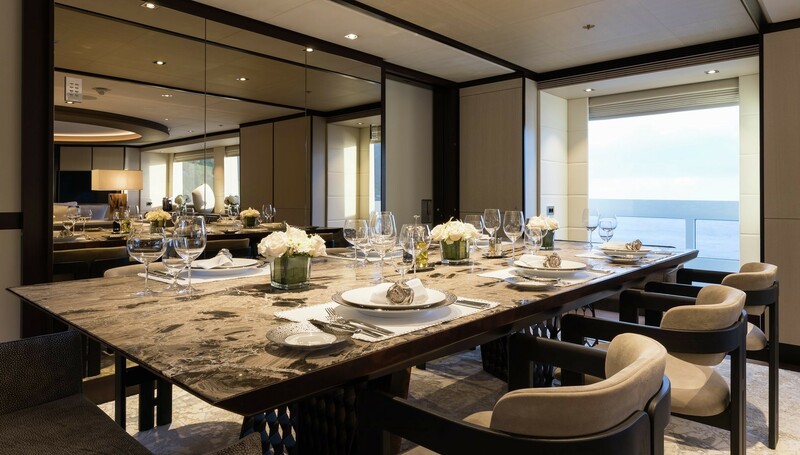 Forward of the main salon is the formal forward dining area, which seats up to 12 guests in an intimate environment ideal for special occasions. 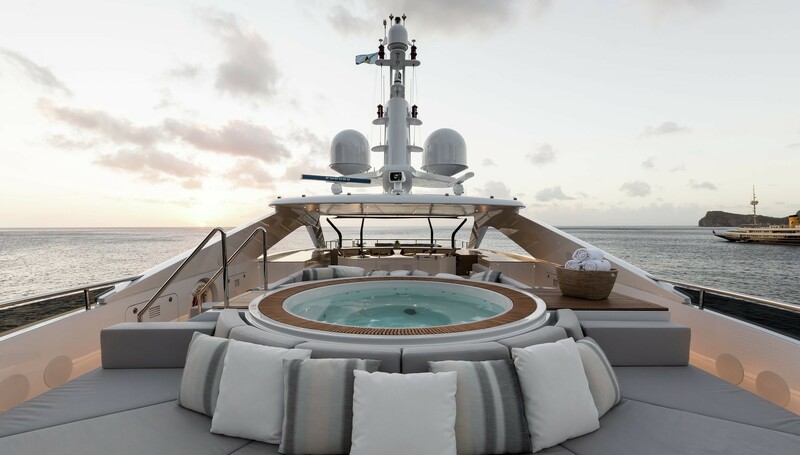 There is a large main deck aft with integrated outdoor seating for morning coffee, while the swim platform ensures guests have close contact with the water and easy access to the water toys. 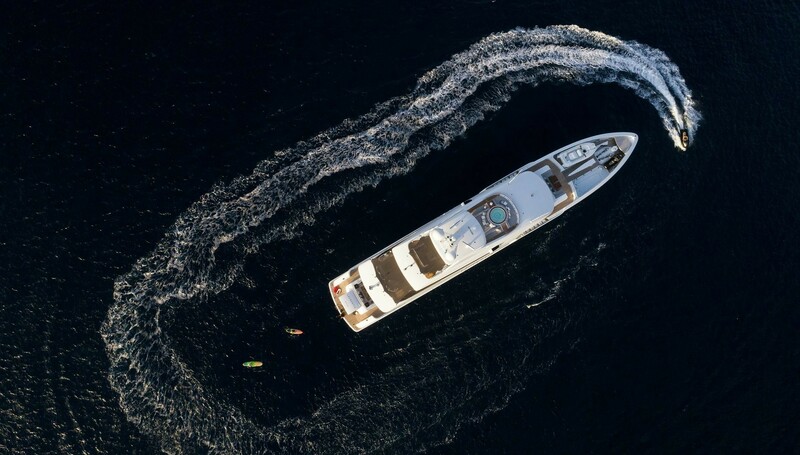 The tenders and toys are stored on the foredeck, leaving the transom free for a spacious beach club to make a welcoming space for guests arriving by tender. 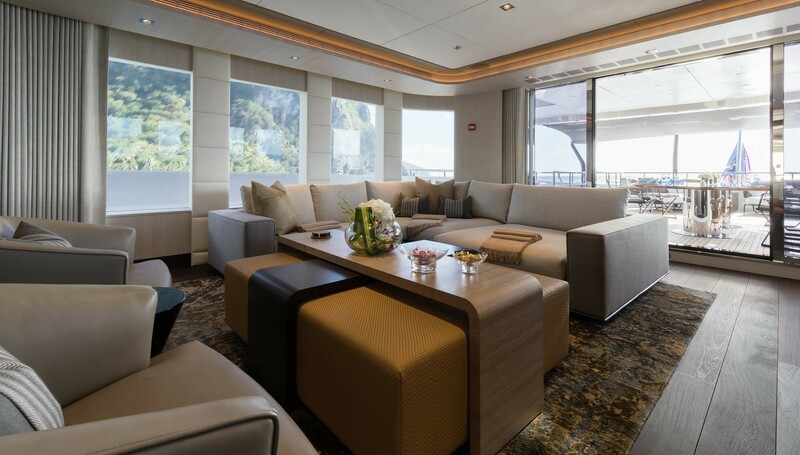 The upper deck sky lounge is fitted for peaceful afternoons and evening entertainment with a large bar placed beside the lounge, which consists of two sofas and two armchairs surrounding a coffee table. 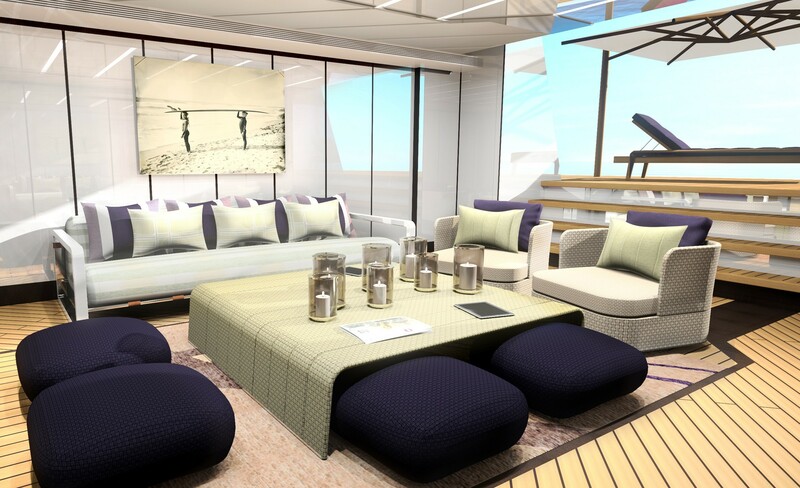 Dine alfresco on the aft upper deck where the extensive dining table seats up to 12 guests for celebrations in style. 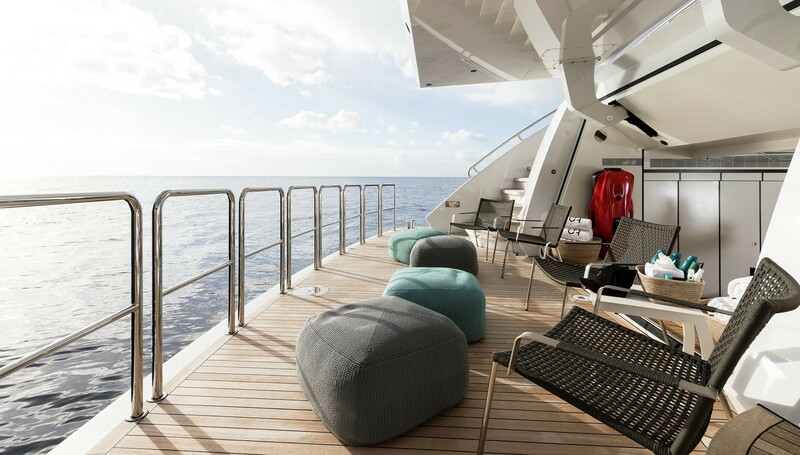 Along the stern, the outdoor lounge is ideally positioned to take in the sweeping views and receive the last rays before sunset. 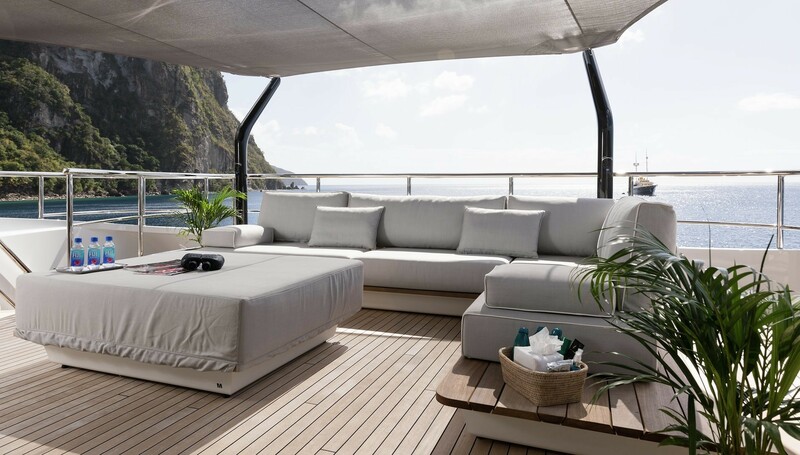 The 110m²/361ft² sundeck is fitted with a forward spa pool surrounded by sun pads and a shaded central section for lounging and alfresco dining. 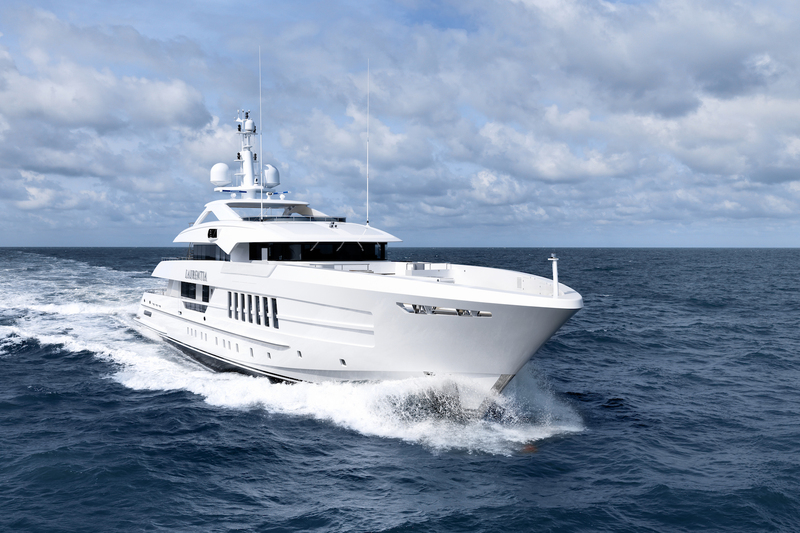 Twin MTU 8V 4000 M63 diesel engines allow her to reach a maximum speed of nearly 17 knots and she has a cruising speed of 15 knots. 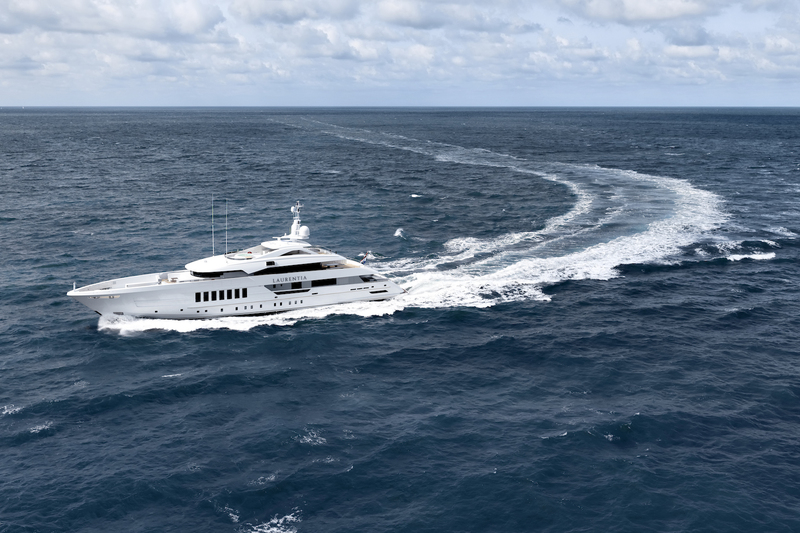 At 13 knot, she is capable of a range of 4,500 nautical miles. 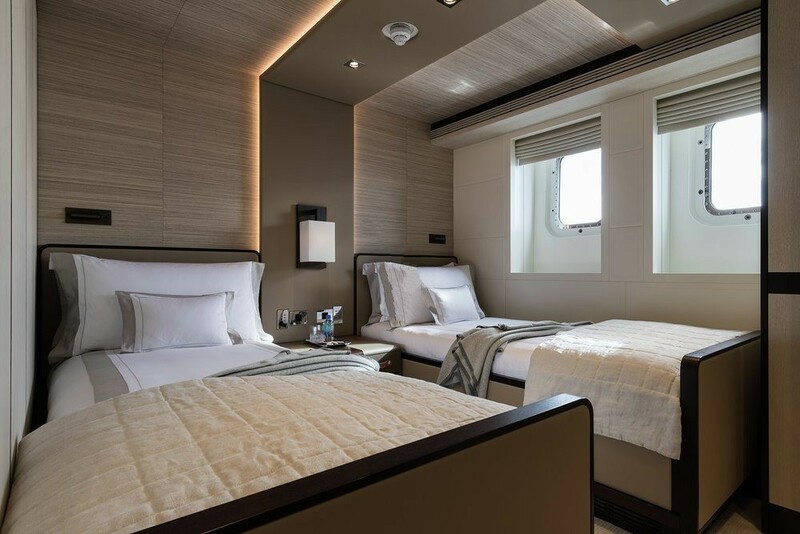 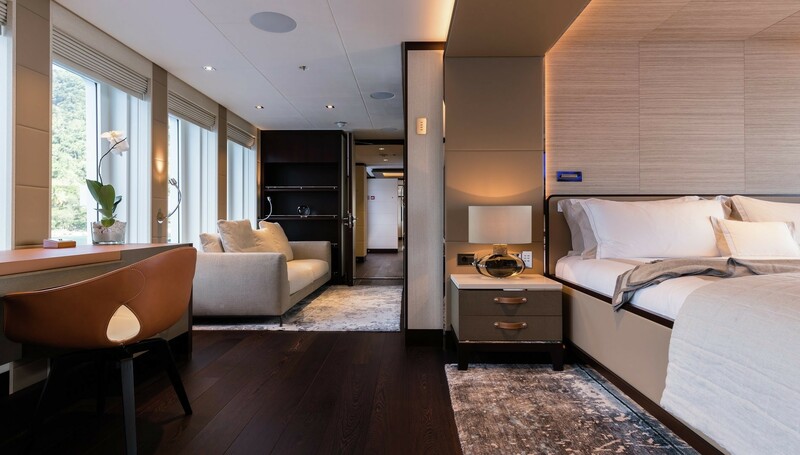 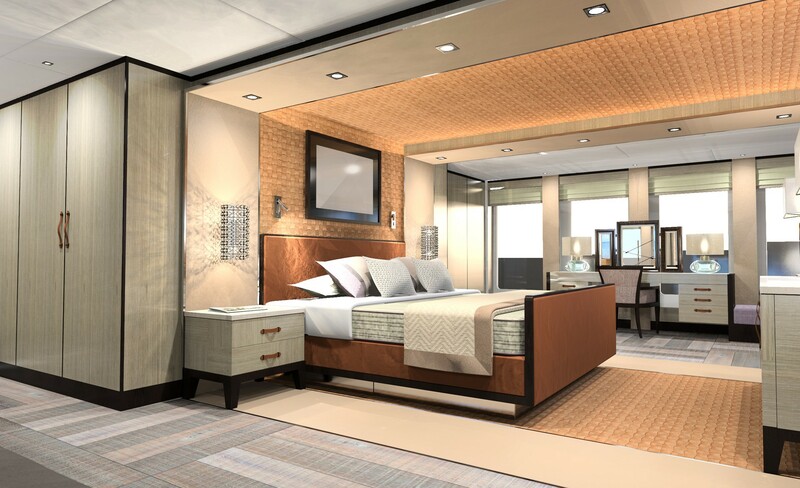 The accommodation is designed to sleep up to 12 guests across 6 staterooms, which include: 1 Master suite, 1 VIP stateroom, 2 double cabins and 2 twin cabins. 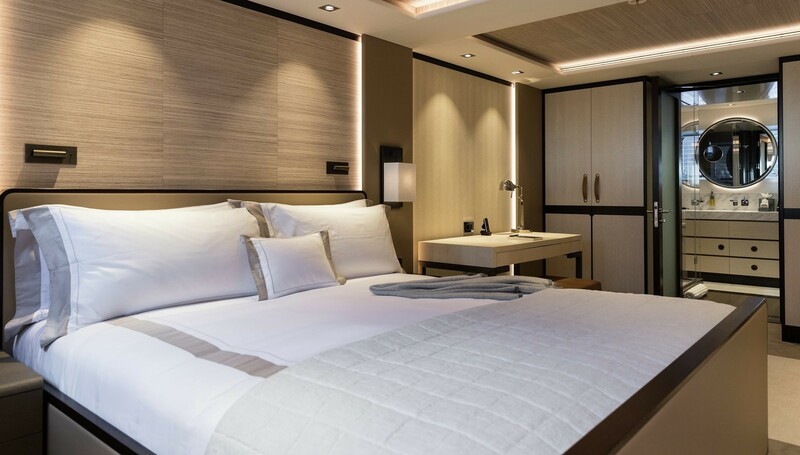 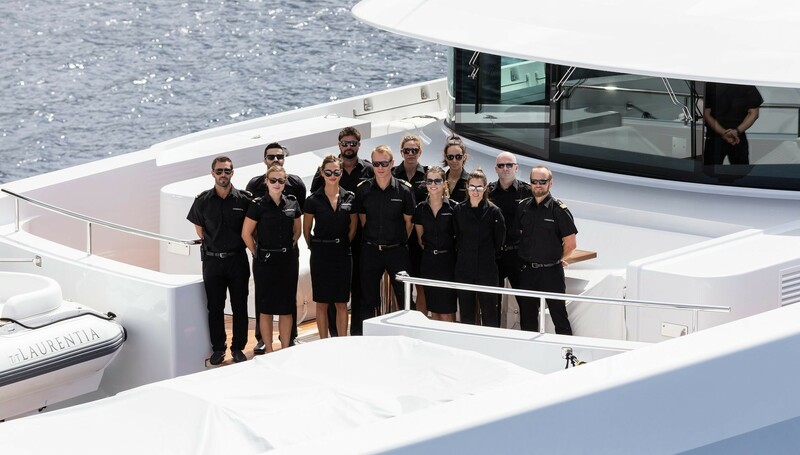 Crew accommodation is designed for up to 14.